Eat First, Think Later. : Seafood...!! 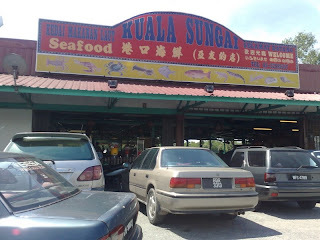 Had lunch at one of the restaurant near the seaside of Kuala Selangor. Noticed that there's a lot of car park there. Must be some good food right? Believe me ... it's real good food! I guess this place is pretty famous. Some of the tables aren't Kuala Selangor people, bet they are from KL cos' they speak Cantonese. 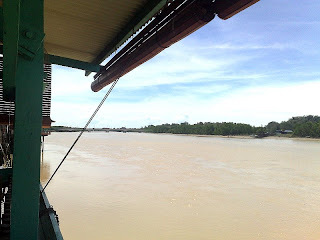 Most of the people in Kuala Selangor is either Hokkien or Mandarin spoken. Restaurant. Look at the number of cars!! It was a good experience trying out the nice looking shell snail though... the only snail I remember eating was Escagot (French Snail). 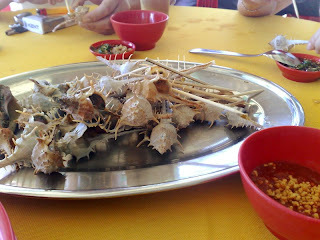 The texture is tougher than the usual snail we eat, dipping it into the special chili sauce taste great! Only thing is that I don't really fancy that sorta taste. Hehe..
Next dish is their homemade otak otak. 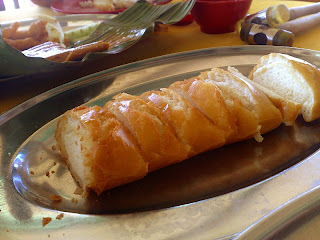 Tasted so different compared to the Muar otak-otak. More seafood taste! I don't know how to describe but it's really delicious. 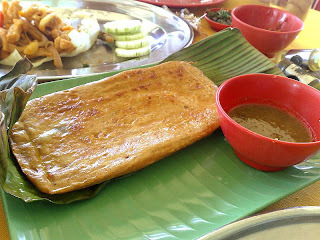 It's served with chilli sauce that's quite sour and it enhance the taste of the otak-otak. 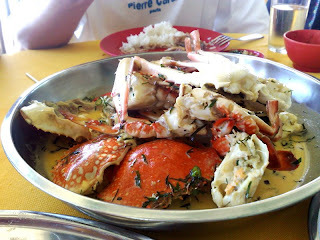 Last dish is the crab. I don't know how they cook it anyway. The sauce is milkish yellowishy and they cook it with curry leaves. Just tasting the sauce really can make you feel like you're in heaven! That was what I felt when I first try the sauce. Man.. I can't forget the taste at all! 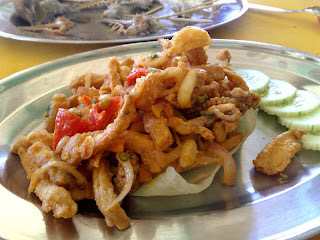 The flavor is slightly like the crispy thingy of "Butter fried prawn". Hope you get what I mean. But this is sooooooooooo delicious! Taste to die for! It comes with the fried bun that you can dip it into the sauce and just eat it. Though I'm so full right now I think I can still have another serving. Hahaha! hey!..that restaurant?..i went before...hmm if not mistaken outside of the restaurant sells alot of keropok 1 rite?..but quite hot eh? You Ate on the boot ? some more put me as sharkie wong..>__<" gone larh my reps..
Json : Not on the boat la.. U think Thailand meh.. akaka! hahahahaha...i can't eat my own kind...wakakakaka.. i'm allergic to seafood.. especially shark fins, so sad huh?..XP.. siput choy not bad wert..hahahahaha..